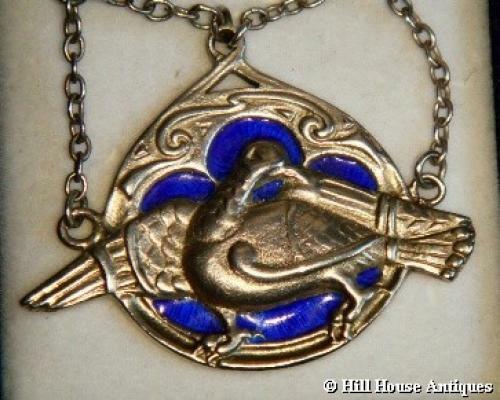 A superb, rare and stunning Arts & Crafts silver and enamel dove necklace from the Iona Celtic Art Workshop of Aexander & Euphemia Ritchie. Fully marked to the back ICA for Iona Celtic Art as well as AR for Alexander Ritchie and the word IONA. Furthermore hallmarked for Birmingham 1933. Beautiful workmanship and quality, the silver offset with deep blue enamels on both front and back of the necklace. The chain with bird and Celtic knotwork and the enamel links interspaced by a double chain. Similar example illustrated in the book on Iona Celtic Art by E Mairi Macarthur page 41.